This Range Rover Gold Portolio: 1985-1995 is a collection of 48 original articles compiled from the pages of Australian Motor Sports, Autocar, Autocar & Motor, Autosport, Car-South Africa, Cars & Car Conversions, Car and Driver, Foreign Car Guide, Modern Motor, Motor, Motor Life, Motor Racing & Sportscar, Motor Sport, Motor Trend, Old Motor, Performance Cars, Road & Track, Safety Fast, Sports Car Graphic, Sports Car World, Track & Traffic, and Wheels. The information collected in these reprinted articles includes 12 on & off-road tests, plus specifications, touring and long-term reports. 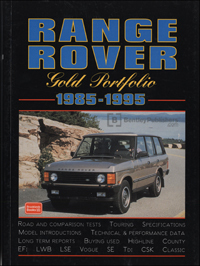 This book provides an insight into the Range Rover and its variants. Enthusiasts will find out about their favorite subject; the unconverted will find something in it to persuade them that they really ought to try a Range Rover for themselves and there will be many people who will find it an invaluable automotive reference.